Before this week, I'd never seen "the most popular musical of all time," Andrew Lloyd Webber's The Phantom of the Opera (it's the longest running show in Broadway history and has the largest worldwide gross of any musical). I was strangely proud of this; to me Phantom represents everything I don't like about musical theater - over-the-top, melodramatic, set-heavy and plot-light. But I decided I should see it at least once to prove my assumptions right or wrong. I'm glad I saw it and it was quite a sight to see, but in short, it was pretty much as I expected. A lavish spectacle of a production with amazing sets and costumes (and yes, the famous chandelier doing tricks), a little hard to follow, a little slow and draggy in parts, but with some beautiful musical moments. Hearing those famous organ chords that begin the title song is nothing less than thrilling. The pit orchestra is pretty fantastic in general, and the three most well-known songs are beautifully performed (the title song, "Music of the Night," and "All I Ask of You"). 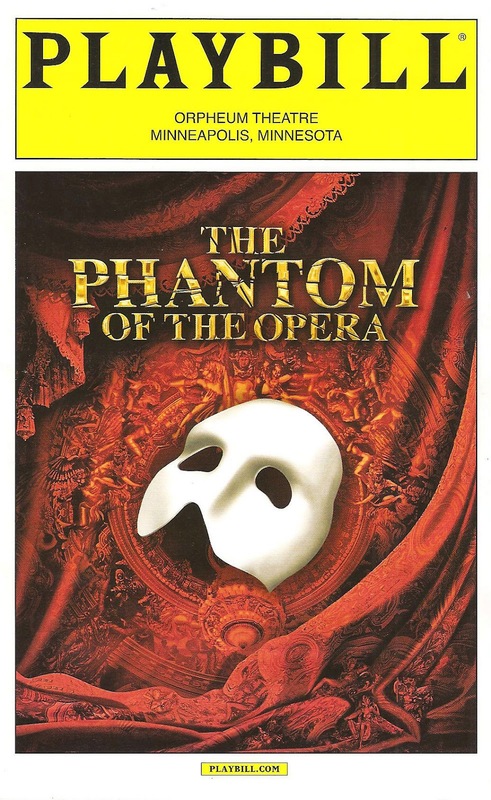 All of the members of the cast give committed performances, including Mark Campbell as the tender-hearted monster, Julia Udine as his obsession Christine, and Ben Jacoby as her suitor Raoul. But my favorite is Jacquelynne Fontaine, who is quite fabulous as the resident diva who gets upstaged by the young Christine. While I do love spectacular sets and gorgeous costumes, they alone do not make a show. I found the plot a little hard to follow (a little more dialogue would be nice) and slow in parts, and I never really understood who the Phantom was and how he became who he was (a psychically deformed man somehow became a learned scholar and artist, then was caged in a traveling circus, and then escaped to haunt an opera house?). Other than the three well-known songs, I didn't love the score, but it skews a little toward the opera side which is not my favorite. It's sooooo melodramatic. Lighten up a little! To quote the wacky and wonderful musical Xanadu, "What is the word for which I search? You know, when something is so grand and so earnest yes ultimately so preposterous that one has to laugh. What does one call that? Andrew Lloyd Webber." The Phantom of the Opera is very grand and very earnest. The Phantom. He seems mysterious and handsome with the mask on, until it comes off to reveal his heavily scarred face and whispy white hair. Still, I felt for him, he's not such a bad guy. If you're someone who loves The Phantom of the Opera, go see this new production, I'd love to hear how it compares. It is a beautiful lavish production, and a spectacle for sure. But that's not what musical theater is to me (my kind of musical theater is this, and this, and this), although judging by it's popularity, I'm in the minority! The Phantom continues to haunt the Orpheum Theatre in downtown Minneapolis through January 5.